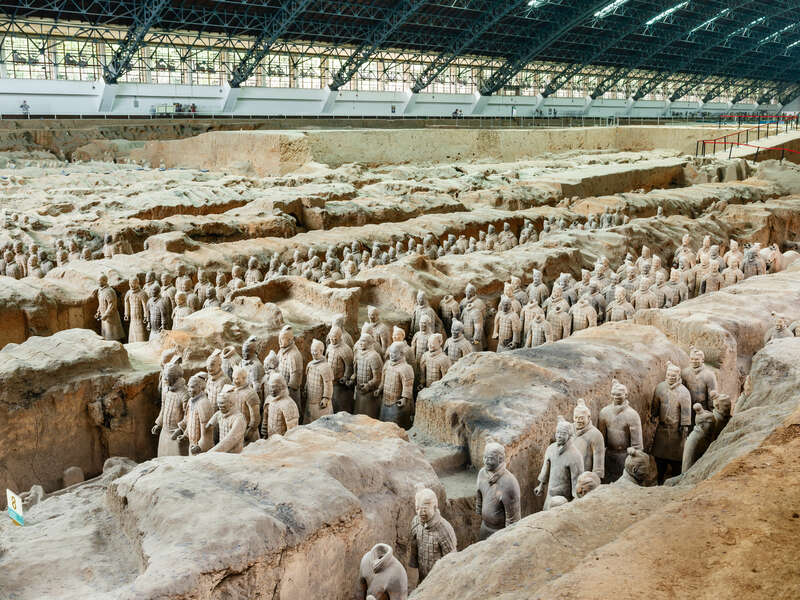 As archaeologists and historians continue to examine the famous “terracotta warriors” from the tomb of Emperor Qin Shi Huang, new knowledge about ancient Chinese history is coming to light. The latest theory is that contacts between China’s “first emperor” and the West may have occurred more than 400 years earlier than had been thought—well before the opening of the Silk Road trade route. Historians have long been believed that emissaries of the Roman Empire likely contacted China during the Han dynasty in the second or third centuries A.D. But experts now say that the work of Greek sculptors probably inspired the amazing statues that were found buried in Qin Shi Huang’s spectacular tomb complex. They even suppose that Greek artists were present to train the Chinese sculptors. The terracotta warriors were first discovered by a farmer in 1974 in China’s northern Shaanxi Province, near the old Chinese capital of Xianjiang. In addition to the more than 8,000 life-size sculptures of infantrymen, archers, and charioteers, numerous statues of circus acrobats and dancers have also been found. These sculptures—displaying bone structure, muscles, and sinews—depict the human form in lifelike motion. It took the Greeks centuries to develop the techniques for this kind of sculpture. Such art forms were unknown in China before the time of the Qin dynasty (246 B.C. to 209 B.C. 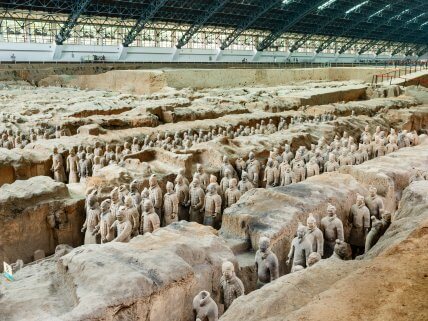 )—and yet they appear full-blown in the terracotta warriors and other statuary in the tomb. Human figurines from the Qin period typically were small, no taller than 10 inches. Additional evidence, in the form of mitochondrial DNA found in human skeletons uncovered in western China, points to the possible presence of westerners in China’s westernmost Xinjiang Province before and during the Qin dynasty. Alexander the Great had conquered militarily as far east as India by 326 B.C., marking the first contact between East and West. It is not hard to imagine that soon after this time, Greek influences reached farther east, all the way to ancient China.